Rising a staggering 12,200 feet above Tenerife in the Canary Islands, stands Spain’s highest mountain and Europe’s largest volcano: El Teide. The ascent to Mount Teide is like going to another world. As we left the beach and climbed, the landscape slowly began to change from black volcanic rock and cacti to an alpine forest and finally to a lunar-like landscape. The park itself lies at around 6,562 feet above sea level and is home to the rock formations of Los Roques de Garcia. Here, you can see the work of thousands and thousands of years worth of erosion, where the wind and grit sculpt eerie and strikingly beautiful shapes out of standing pillars of rock. The best way to reach the highest point of the peak is by the cable car, Teleférico del Teide. In just about 8 minutes, the cable car swooped us up to just 200 meters from the summit.We were literally above the clouds and enjoyed breathtaking views of the islands of Gran Canaria, La Palma, La Gomera and El Hierro. With a pre-arranged permit, however, you can walk up to the very mouth of the dormant volcano itself. We learned, unfortunately too late, that to get the permit, you have to contact the Park Administration office in Santa Cruz and take your passport there to get the free permit. Limiting visitors in this way protects the extremely fragile ecosystem. Since we couldn’t ascend, we hiked down to the Refugio de Altavista where we were hoping to locate the Cueva del Hielo, or ice cave, we’d read about. It too proved elusive; despite following the directions given to us at the Refugio, we never did locate the ice cave. None the less, the lunar landscape was beautiful and we both got quite the workout on our hike back up to the cable car station. 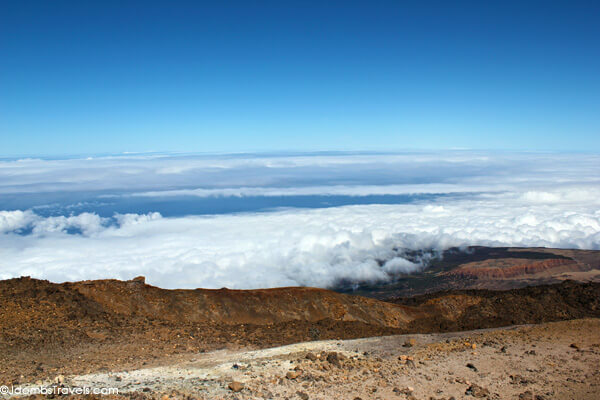 A permit for the summit can be obtained from the national park office in Santa Cruz de Tenerife located at Emilio Calzadilla 5; open from 9am-2pm. Take a copy of your passport. Or book your permit online in advance. The cable car runs from 9am to 4pm. The last ascent is at 4pm and the last descent at 4:50pm. Don’t miss the last descent or you’ll have a very long hike down! A round trip ticket costs €25 for adults and €12.50 for children. Thanks, Stef! Hiking Mount Teide is a lot of fun. Remember to dress in layers if you go! I’ve hiked mainly on Gran Canaria, where I live, La Gomera, and Lanzarote. Now though I want to pay a trip to the neighbouring island of Tenerife and conquer Teide. Thanks for inspiring me, Jennifer. Reminds me of a volcano in New Zealand at Tongariro – gorgeous views! Oooh, we haven’t been to New Zealand yet. Sounds like we have some awesome hiking in store for us when we do make it. No hiking up mountains for me, the cable car sounds great! LOL! There were definitely people that just took the cable car up to look at the view and there is a picnic area you can easily walk to. Some others were having picnic lunches. I’m with the above poster. I’ll take the cable car! Great photos and a very interesting landscape. We were in Spain for about 6 weeks but didn’t make it here unfortunately. It’s incredible how the landscape changes from desert to pine forest to volcanic rock as you ascend.